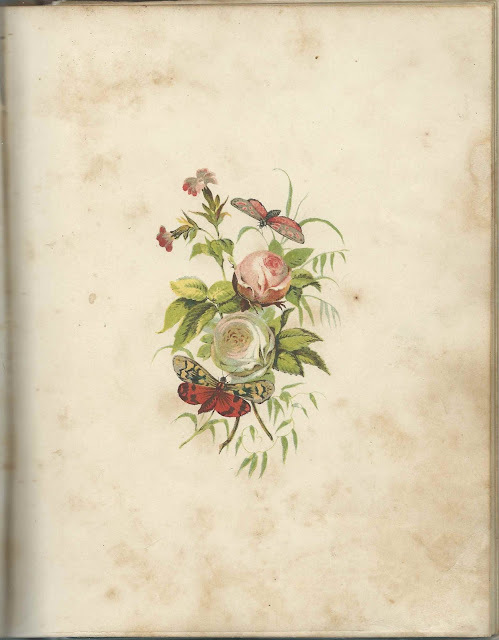 1857 to 1863 autograph album kept by Mary F. Lawrence, "Fannie", who appears to have been a student at a school for young women, presumably at York, South Carolina. The album was presented to Fannie M. Lawrence, or Mary Frances Lawrence, by her father, whose name was not given. He may have been Allen G. Lawrence of York, South Carolina. Fannie may have attended the Yorkville Female Institute, also known as Yorkville Female College. Read more about the Yorkville Female Institute on this post from the blog Roots and Recall. At least three of the inscribers are mentioned here, though the name of one student, Fannie Douglass, is misspelled as Nannie. Fannie Douglass was the only inscriber to dedicate her page to "Mary", rather than "Fannie". The album, which was published by J. 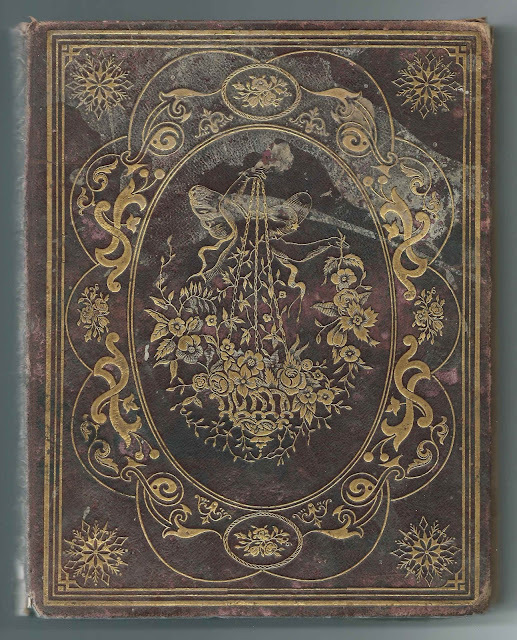 B. Lippincott & Co. of Philadelphia, measures approximately 8" by 6-1/4" and contains four pages with color designs interspersed throughout and the sentiments of 38 of Fannie's relatives, friends and fellow students from South Carolina and North Carolina. An alphabetical surname list and an alphabetical list of the inscribers, with any personal information they offered, appear at the end of this post. 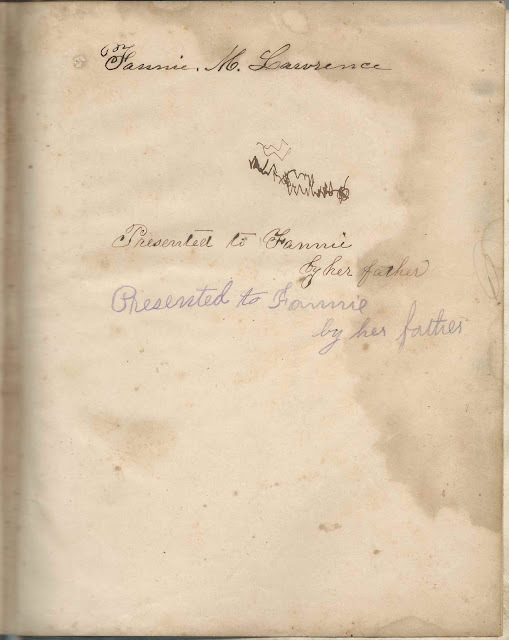 Mary F. Lawrence, "Fannie", wrote her name on the title page; or perhaps her name was written by her father. If I have the correct "Fannie", Mary F. Lawrence, presumably Mary Frances Lawrence or Mary Fannie Lawrence, or, as on the presentation page, Fannie M. Lawrence, was born about 1840, the daughter of Allen G. Lawrence and Martha (Peters) Lawrence. 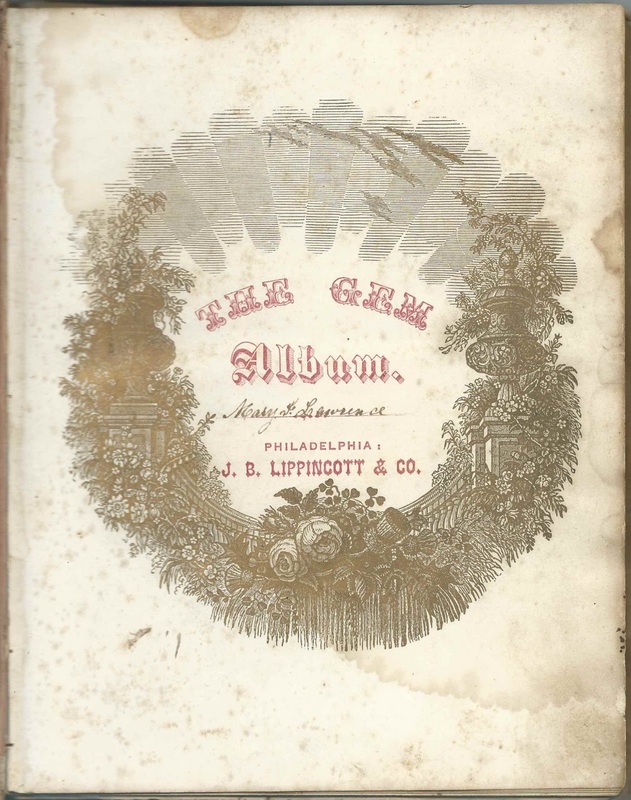 Allen G. Lawrence died in July 1860, during the time frame of this album. I found a listing of interments in the Bethel Presbyterian Cemetery at York, South Carolina, that shows a Mary Frances Lawrence born 1829 and died 1855. This, however, doesn't match the York District, South Carolina, Census records of 1850 and 1860, which give her birth year as about 1838 and 1842 respectively, and have her still very much alive in August 1860. Perhaps the file has transcription errors. 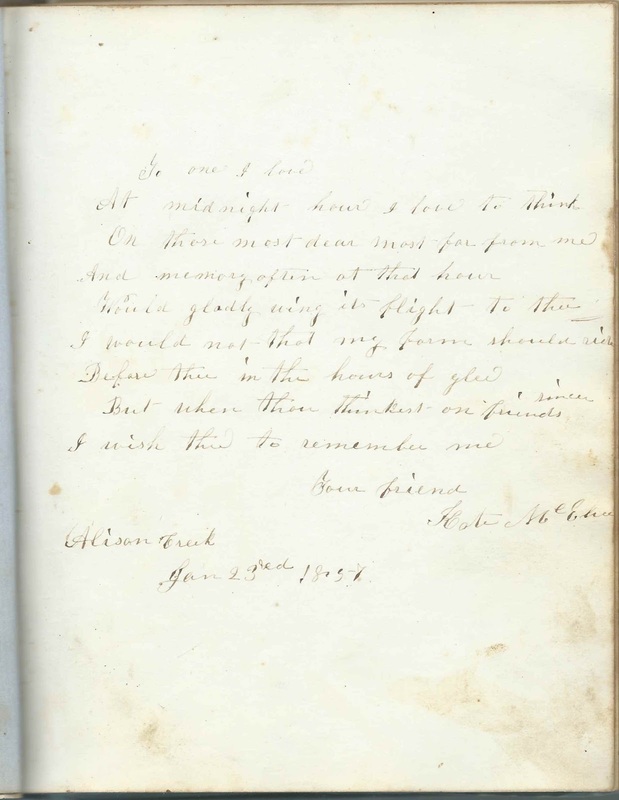 Hopefully a reader will leave a comment with the identity of Kate McE?, who inscribed her page, shown below, on January 23, 1857. Kate either hailed from Alison Creek, now Allison Creek, South Carolina, or she inscribed her page there. Kate McE? ; from or inscribed at Alison Creek, South Carolina, on January 23, 1857; now Allison Creek - see the image of her page, above. M. M. Bookman; from or inscribed in Fairfield District, South Carolina, in January 1857. Fannie's classmate. Fannie Douglass; from or inscribed in the Chester District, South Carolina, on March 7, 1857; inscribed "To Dear Mary". Jennie Ferguson; from or inscribed in York District, South Carolina, on March 18, 1857. Inscribed to "Fane Dear". Possibly Jane Ferguson. Lou Sadler; from or inscribed at Yorkville, South Carolina, on January 23, 1857. Perhaps Louisa Minor Sadler.